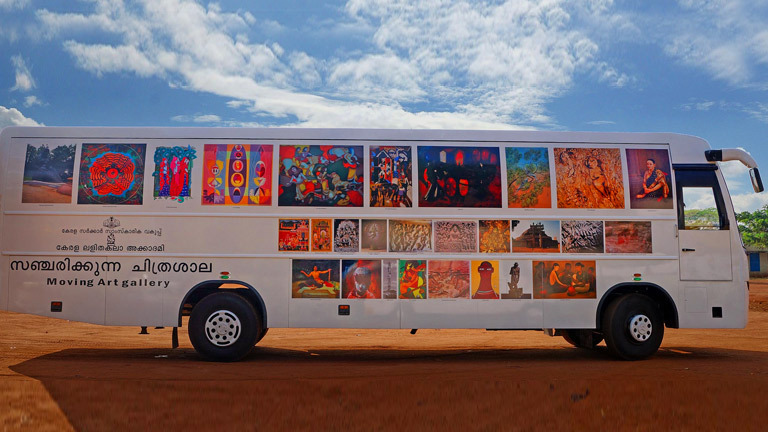 The Mobile Art Gallery of Kerala’s Lalitha Kala Akademi is without any comparison. This novel project intends to take art to places where there are no art galleries and to popularize art exhibitions on a wide scale. The Mobile Art Gallery is a huge vehicle with modern lighting and display facilities. It is fully air - conditioned. Paintings, sculpture and books are exhibited inside the vehicle. This provides art lovers a new experience. The first journey of the mobile gallery was from Thiruvananthapuram to Kasaragod showcasing Kerala’s rich art history. It portrayed the growth and evolution of Kerala’s art and culture. The exhibition included the works of eminent artists like Raja Ravi Varma, K.C.S. Panicker, Padmini, M.V.Devan, besides mural paintings, cave drawings models of ancient pictures and sculpture. The exhibition also included the works of later artists. The mobile gallery also facilitates the screening of documentary films based on art and sculpture. Works of famous artists belonging to different district were initially screened. The exhibition was later held in Nasik. It was widely appreciated by Malayalis and non - Malayalis, and came in for save reviews. The success of the first mobile exhibition was followed up including the works of contemporary artists. Artists have the privilege to hold independent exhibitions through the mobile unit. The aim is to give importance to the concept of picture on wall. The concept (message) intends to bring Malayalis closer to art exhibitions and to create a market for art. This will carry the message among the public that a congenial environment be ensured for the artists of Kerala. Instead of the public going in search of galleries, art comes to your doorstep. By having adequate opportunities for viewing art exhibitions it will be possible to ensure the progress of visual art in Kerala. The mobile exhibition unit strives to achieve this purpose. The Mobile Art Gallery has various possibilities. The unit is thus one of the best models to impart lessons of viewing art exhibits. It becomes possible to display art form time immemorial with complete details, thereby creating a new awareness among different communities on art through exhibitions and screenings. The unit can reach out to rural areas in a big way. It is for the first time that such a mobile exhibition has been conducted anywhere in India. Kerala Lalitha Kala Akademi’s mobile exhibition unit was flagged off on 20 January 2013 by the Chief Minister of Kerala.